Lyric hearing aids are hassle-free and are worn for up to two months at a time. They do not require batteries and you can sleep and shower with them in your ears. You may even forget you’re wearing a hearing device. 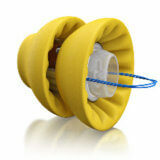 Hearing loss should not hold you back, and neither should your hearing solution. Lyric is a different way to hear better without having to wear hearing aids over the ear. Lyric hearing aids are also 100% invisible so nobody will know you have them in your ears. What are Lyric Invisible Hearing Aids? Lyric’s inventors had an original mission to create the best possible hearing solution. They knew that amazing sound quality was key and that the closer a device could get to the eardrum, the more natural the sound quality would be. But to achieve incredible sound quality and comfort, Lyric’s team of ENT physicians and engineers had to break past the existing limits of acoustics, processing and power supply. 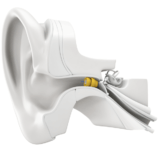 Today, Lyric hearing aids use advanced micro-engineering that leverages the ear’s organic shape to capture sound and amplify it with minimal processing. With Lyric, sound enters the outer ear and flows naturally toward the eardrum, so it delivers pure, beautiful sound. And it does all this for months at a time without the need for battery replacements or daily maintenance thanks to patented moisture protection mechanisms and breathable materials all while staying completely out of sight. Contact us for details about a hassle-free 30-day trial period and learn more about invisible, incredible hearing with Lyric hearing devices. Happy Ears Hearing Center now serving Peoria, Surprise, Sun City, Sun City West, North Phoenix, Glendale, Goodyear, and Scottsdale, Arizona.